When comparing notes with male foreigners who have travelled to remote parts of Indonesia, I often find that we have quite different perceptions of village life. That’s in part because I have the extraordinary privilege of being able to spend time in the kitchen with the women as well as in the coffee shop with the men (this strange, white beast being allowed to tread where local women wouldn’t). This means I hear different stories about all sorts of things: politics and history, culture and family life. While men clearly dominate the public sphere throughout Indonesia, I’ve become increasingly convinced that at the level at which the business of society really happens, about which decisions are made about family and social investments, about who goes to which school and whether to buy a TV or a sewing machine, it’s Indonesia’s women who are in charge. As the boxing match between the KPK and the police rumbles on, Jokowi seems to have thought, too, about the potential for Indonesia’s women to quietly get on with the hard work of putting a stop to the fisticuffs. He’s appointed an all female panel to choose the next anti-corruption commissioners. It’s dispiriting that this is such a hard task. The Jakarta Post reported former KPK commissioner Busyro Muqoddas saying that members of the selection team should be mentally prepared to deal with people offering them bribes to select one anti-corruption commissioner over another. The reactions to the all-female panel have been mixed, though perhaps none more extreme in it’s misogyny than this extraordinary rant from a university lecturer in law. (And we wonder why Indonesia’s legal system is so roundly despised by most citizens…). Other commentators have said that Jokowi is reaffirming women’s place in Indonesian politics: he has eight female cabinet ministers. In this commentary in the Nikkei Asian Review, I argue that the female panel will probably do a good job of selecting commissioners because they are less tied in to patronage networks than men are. That’s a good thing for the nation, obviously. But it’s the result of women being denied access to the public sphere, and thus having to survive on their wits and their talents rather than their connections. I’d be curious to know what readers think about this. But before you point out the exceptions to the rule that women in Indonesia tend to be carried forward by talent rather than connections, let me do it for you. It’s certainly something Jokowi is aware of. 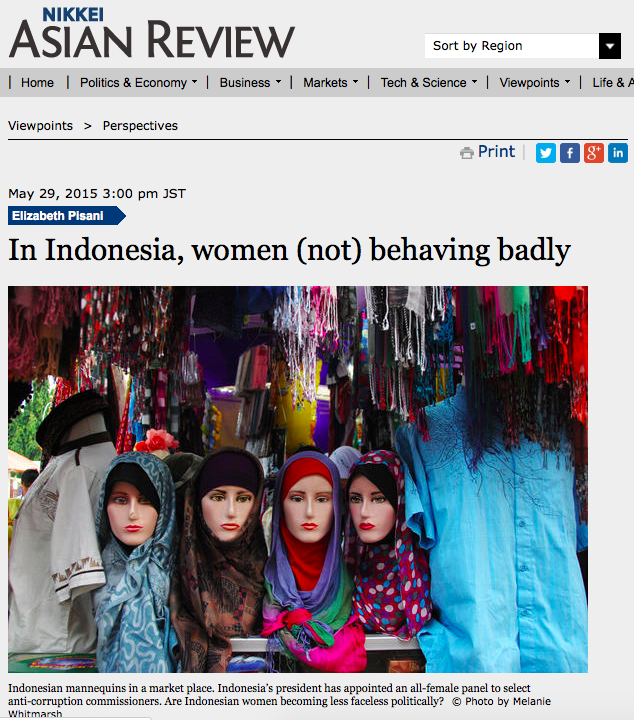 1 Comment on "Too much testosterone: can women save Indonesia?" The Jawa Pos Opini entry that you linked to above is indeed horrifying; on the other hand, the majority of comments were takedowns of the column (“Lah buset, ini misoginis level over 9000”), so it’s heartening, in a sense. I agree with your argument that Indonesian women are in general less tied, and therefore less beholden, to the patronage networks. Re: Jokowi’s cabinet, what do you think about Menteri Susi, who to me seems to embody the populist swagger with her unconventional personal presentation and shoot-from-the hip statements?